Jewish Americana: L.A. musician will hum a folksy new tune in S.F. – J.
Jewish Americana: L.A. musician will hum a folksy new tune in S.F. What normally would take more than a year to record Himmelman was able to accomplish in just two short weeks, giving the album a more spontaneous, truthful feel. And in reality, there wasn’t much chance of that happening either — Himmelman’s musical career spans 30 years, starting with his power-pop band Sussman Lawrence in 1980. He’s received radio play and an Emmy nomination, scored dozens of television episodes and films, hosts an XM radio show — “Peter’s Jukebox,” teaching kids about music — and has released nearly 20 albums. Currently on tour in support of the new folksy gem, the singer-songwriter-guitarist makes his way north next week to play San Francisco’s Café Du Nord on Thursday, Feb. 10. Himmelman has a recording studio in the Santa Monica house he shares with wife, Maria Dylan (daughter of Bob Dylan), and where the couple has raised their four children, now ages 14 to 21. But for this record he got back to his roots, working on the album at the Brew House studio in his hometown of Minneapolis. In sixth grade he started playing piano and guitar. He still plays both during recording sessions and live shows. After his dad died when Himmelman was 24, the young musician found solace studying with a Lubavitch rabbi in Crown Heights, Brooklyn. Recalling his reason for seeking religion during those tough days, he says he was probably just auspiciously ripe for the picking. Himmelman met his future wife a few different times throughout those early New York years, but “the one that caught” was at age 27. They moved to California in 1988 and started their family. He’s been on the road touring throughout, though as an observant Jew he’s never played a show on Shabbat. That’s meant turning down prime gigs and talk show offers. Today, Himmelman doesn’t define himself as Orthodox per se, but he attends Shabbat services at Chabad, keeps kosher, davens daily and lays tefillin. He also occasionally attends services at “hippie shuls” where he says he forces himself to get up and dance. “I feel it’s good for me, to get up and join these sweaty men letting loose — the joy of simcha!” he says. His own music has a decidedly less excitable tone, at least on the latest album. In the somber and lovely “The Mystery and the Hum,” Himmelman muses on major life shifts, from the writer’s strike that put his job with the TV show “Bones” on hold to the graduation of his son from high school. 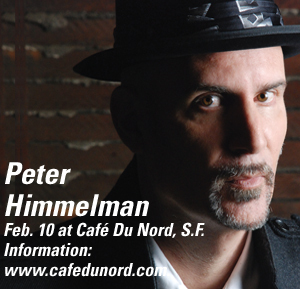 Peter Himmelman performs at 8 p.m. Thursday, Feb. 10 at Café Du Nord, 2170 Market St., S.F. Tickets: $18. Information: www.cafedunord.com. 1Is this Berkeley seder ‘plate’ the world's largest?